We appreciate that choosing the right ergonomic chair for you is extremely complicated. There is endless advice on the internet and all sorts of claims by different chair companies. This is why we end up replacing so many office chairs for our clients, even high-end £1000+ plus chairs that have proved unsupportive and contributed to, rather than eased back pain. This must be both height and depth adjustable. Why? Our own individual lower back (lumbar) curve differs greatly in both depth and height and yet it is key that this area is supported in the right place, that the ‘gap’ is filled according to your own depth and height of lumbar curve. 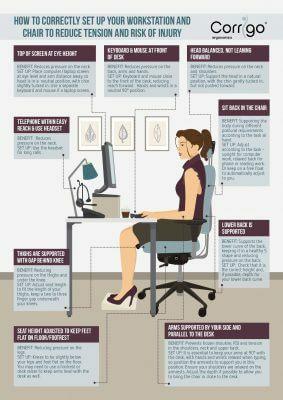 When we sit, we need to keep our backs in a healthy S shape. Without the correct lumbar support, we will naturally end up slouching and sitting in a C shape. This puts pressure on the whole of your spine and will cause tension and pain build up. Once you have a sensitized back it is even more essential to keep this part of your lower back supported in the correct position. Why? If the seat is too wide or too narrow, you won’t be able to use the armrests correctly – see armrests section below for why this is important. These must be height and depth essential, be at the correct width for your elbow breadth and allow you to bring the chair in close to the desk. Why? Non-adjustable armrests are the biggest cause of tension build up in the neck, shoulders, upper and lower back, as unsupported arms are surprisingly heavy. Furthermore, if your arms aren’t supported in line with the desk, you end up either leaning forward onto the desk for support or slowly sinking down in your chair through the day. If the arms aren’t in line with the desk, the pressure will build in the wrists. This can result in RSI, frozen shoulder and a wide variety of other back issues. Adjustable backrest angle and seat angle will help you to ensure that your own ideal posture is supported and any build-up of tension is reduced. In addition, having a backrest that will encourage an upright, open chested posture by supporting between your shoulder blades rather than pushing you forward into a slouch (like most broader backed chairs) is highly recommended.